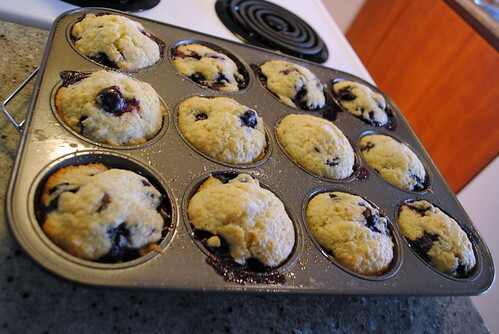 Few things are tastier when fresh out of the oven than soft, fruity muffins with perfect sweetness and tender crumbles. 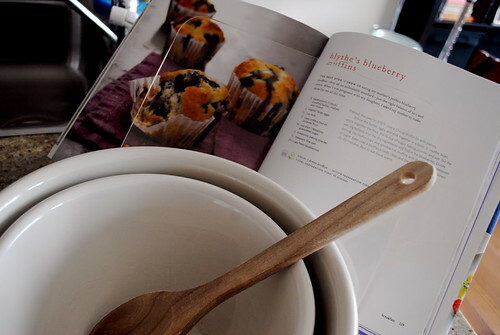 For those of that you don’t bake – or are just learning how – muffins are one of the easiest items to start with. 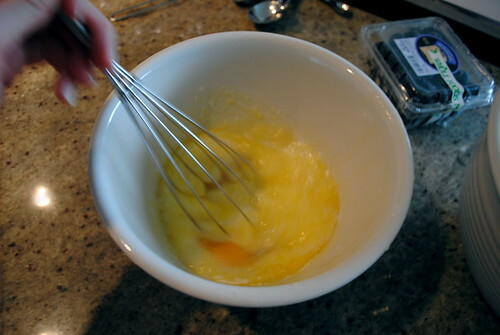 However, they’re also one of the easiest recipes to mess up if you’re not careful. Growing up, it was Gwyneth Paltrow’s mom, Blythe Danner, that made the family’s best muffins. Decades later, G still craves her mom’s baking and found herself constantly requesting this very recipe when she was pregnant with Apple. This week I departed from stocks and soups and tried this legendary recipe on for size. What I instantly appreciated about this recipe was that it called for ingredients that most of us have on hand in our kitchens. I had to make a quick trip to the market for some organic blueberries and farm fresh eggs, but everything else I found in my cupboards. Muffins are one of the only baking recipes for which I will not use my beloved KitchenAid stand mixer (you’ll find out why in a moment). 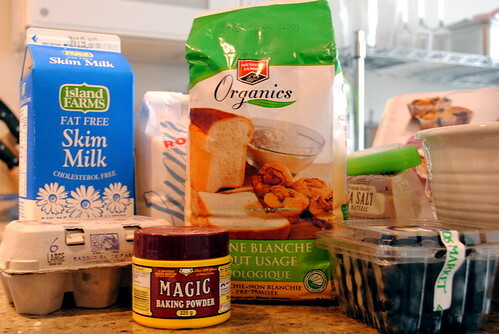 Typically speaking, muffin recipes consist of a bowl of dry ingredients whisked together and a separate bowl of wet ingredients. 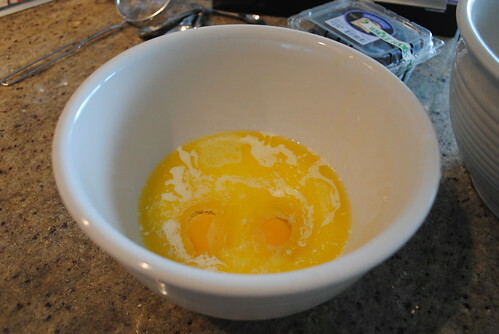 In this case, the recipe included milk, eggs and butter that had been melted but cooled. It’s important to let the butter cool completely after melting or it will cause the milk to curdle once you try to whisk them together. 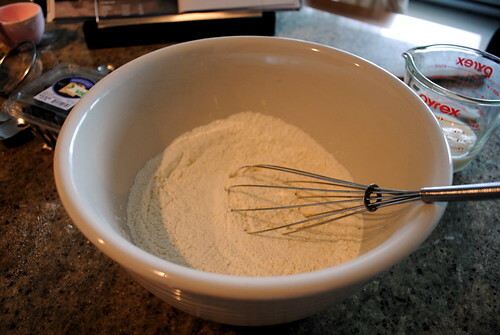 After both bowls have been properly whisked – separately – the best method is to make a well in the middle of the dry ingredients. 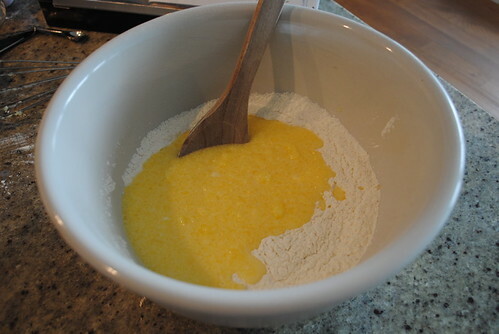 Pour the liquid ingredients into the dry ingredients and fold the batter only until the liquid and dry ingredients have made a batter. 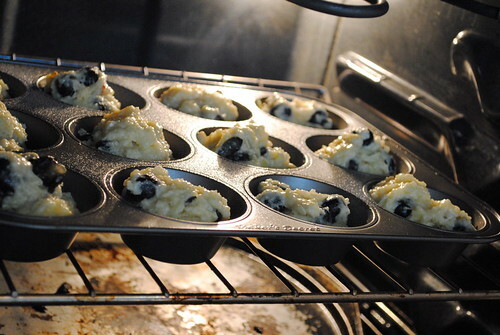 Over-mixing will cause your muffins to be dry and dense. 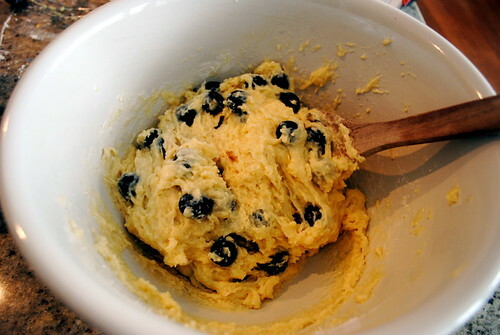 Once the batter has been folded, toss in the blueberries and continue to fold but only as little folding is as needed. This recipe would also work deliciously with cranberries and orange zest! A tiny sprinkle of sugar on each of the muffins tops them quite nicely. Et voila! Apart from one runt in the back that didn’t rise as well as I’d hoped, the muffins turned out perfectly. They were warm and moist and between J and I, nearly half a dozen was gone within an hour or two! I prefer mine smeared with butter. While I have stated before that I won’t be publishing the actual recipes throughout my G-ology project for ethical reasons, Self magazine has published the recipe online. Another habit I’ve picked up recently? Many of G’s recipes make multiple portions which, when you’re cooking for one or two, leaves a lot of leftovers. Freezing soup, stock and even fresh herbs for later use has proven to be really handy. Make sure you date everything and follow a recipe’s freezing instructions if there are any. 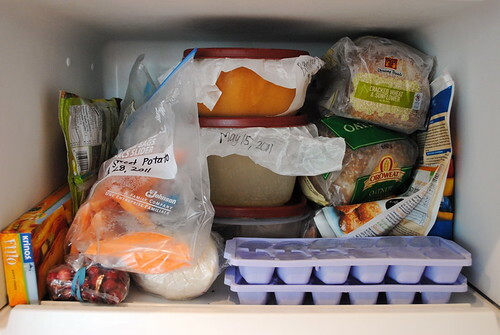 Most foods will keep for a few months if properly stored in the freezer. mmmm, my favorite of my mom’s baking is blueberry muffins, cinnamon rolls and chocolate chip cookies.